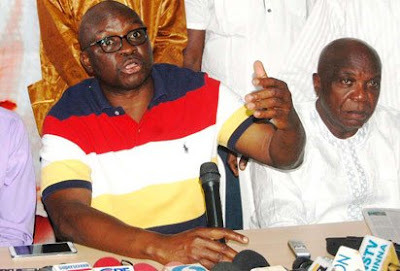 The Ekiti State Governor, Mr. Ayodele Fayose, has said he will never leave the Peoples Democratic Party for any other party despite the crisis within the PDP. Fayose said this in Osogbo on Tuesday when he visited Governor Rauf Aregbesola at the Government House, Osogbo in company with about 50 dignitaries including the Speaker of the Ekiti State House of Assembly, Mr. Kola Oluwawole. The governor said he read on the Internet that he was coming to Osogbo to beg Aregbesola to plead with President Muhammadu Buhari not to probe him. He said, “I have not come here for that; neither have I come to announce my defection from the PDP. I will never leave the PDP for any party. This is my first official visit to any APC state in Nigeria. I am not in Osogbo to ask Aregbesola to help me beg (the President) as being speculated in some quarters. We are all Yoruba, politics is like water; it can flow anywhere. “I believe in the Yoruba race; the race comes first before the office of the governor. The race is eternal while that of governor is temporal. We must watch today to be guided by tomorrow. I am here for the unity of Yoruba as it affects the Oodua, our progenitor. Fayose stressed that Yoruba people needed to unite irrespective of their political or religious affiliations to ward off blackmail and oppression. The PDP governor said the financial crisis caused by the fall in the price of crude oil could be used as an opportunity to develop other sectors of the economy. He said, “There is need for Yoruba people to come together irrespective of political parties to protect the interest of the Yoruba man and protect their leaders from being blackmailed or oppressed. Aregbesola, who commended Fayose for the visit, stressed the need for state governments to create economic ties that would rescue the people from poverty. Meanwhile, the Olukere of Ikere Ekiti, Oba Ayodele Obasoyin, has cautioned the Fayose regime against stoking violence in Ikere by denigrating his office. Oba Obasoyin said a statement credited to the Deputy Governor, Dr. Kolapo Olusola, an indigene of the town, claiming that the only recognised monarch in the town was Ogoga signaled government’s sinister and clandestine intention to wipe off his stool from history. Addressing journalists on Tuesday at his palace in Ikere Ekiti, the traditional ruler flaunted the Ikere Intelligence Report of 1933, among several other documents, including those written from the state Local Government and Ministry of Chieftaincy Affairs to substantiate the authenticity of his throne. He said the provocative statement had created tension in the town, saying he had been pleading with his people to calm down and allow the court to adjudicate on the matter. According to him, the last voucher showing payment of salary to Olukere dated back to 1989 and it is on government’s website that there are two kings in Ikere Ekiti. To buttress his point, Oba Obasoyin said the state government had failed to respond to three memos he wrote advocating that the staff of office be presented to him. “A couple of weeks ago, Governor Fayose called me to his office and warned me against giving Ogoga any problem and that he would fight me with all the paraphernalia of his office if I should take any action against my rival. “The Attorney-General, Owoseeni Ajayi; Chief of Staff, Dipo Anisulowo; Commissioner for Works, Kayode Oso; Fayose’s CSO and one of his sisters were present at the meeting. “I want to say that Ogoga, who Governor Fayose was parading as his recognised king, came to this town in 1836 from Akure; this is on record. About six Olukere had been installed before he came. Why should the landlord now become a tenant? Nobody can rewrite this in history.